They were young Jewish boys who escaped from Nazi-occupied Europe and resettled in America. After the United States entered the war, they returned to fight for their adopted homeland and for the families they had left behind. Their stories tell the tale of one of the U.S. Army's greatest secret weapons. 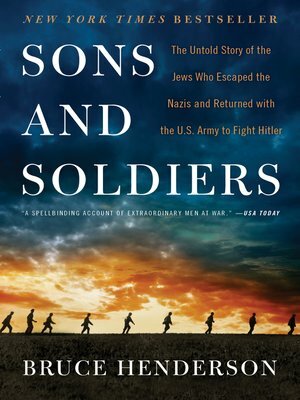 Sons and Soldiers begins during the menacing rise of Hitler's Nazi party, as Jewish families were trying des-perately to get out of Europe. Bestselling author Bruce Henderson captures the heartbreaking stories of parents choosing to send their young sons away to uncertain futures in America, perhaps never to see them again. As these boys became young men, they were determined to join the fight in Europe. Henderson describes how they were recruited into the U.S. Army and how their unique mastery of the German language and psychology was put to use to interrogate German prisoners of war.